Sunsets are such a universally intriguing phenomena. 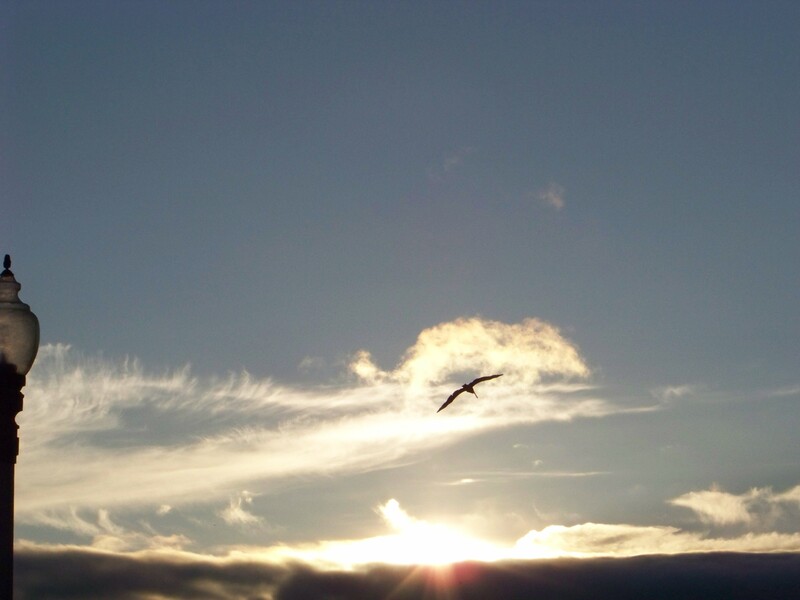 Historically, sailors used the characteristics of sunsets to anticipate the coming weather. Scientists explain the way the light is broken up at the horizon, spilling brilliant colors across the landscape or water. Artists and writers find inspiration, and many others sense the grand design in the often spectacular displays. I see them much as I see the Autumn: the end of one thing, and the promise of something new to follow. We can’t choose the quality of any given sunset – each one, like each day, is an individual gift. 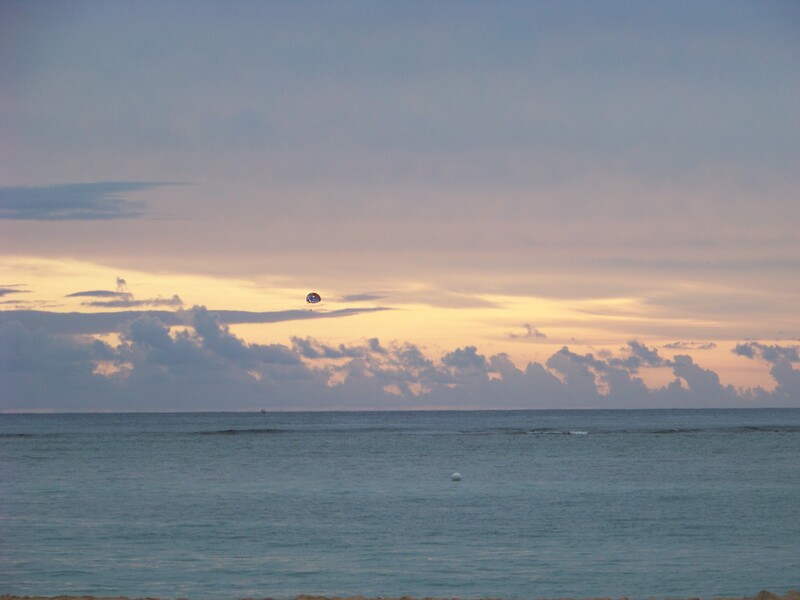 When we were in Honolulu, around sunset we usually sat at our hotel facing the ocean, and we got varied results. 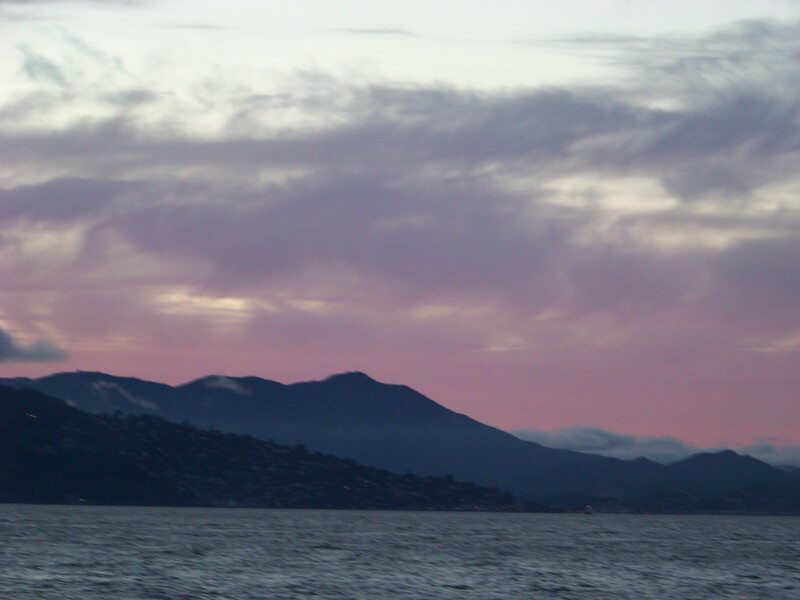 Most evenings, we saw subdued pinks and blues from behind scattered clouds, with boats or hang gliders silhouetted in front of them. Then one night, we had a fabulous display over the hotel’s lagoon. Amazingly, most of the water still appeared blue, but the sky was ablaze. 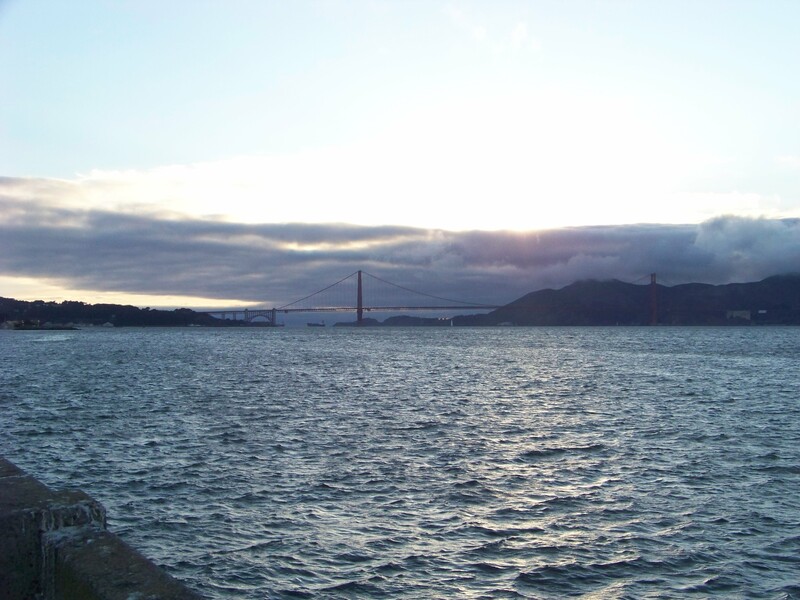 Always looking for a photo op, the last time we were in San Francisco, I stood out on a wharf, hoping to get a fabulous silhouette of the Golden Gate bridge against a wonderful palette of sunset colors. I was optimistic as I caught a gull in the sky just before sundown, and I set up my shot of the bridge. Alas, I forgot I was in San Francisco. The sun went down onto the Pacific in the West, behind a huge bank of clouds. My planned silhouette was not to be. But then I turned the other way and looked back toward the city. 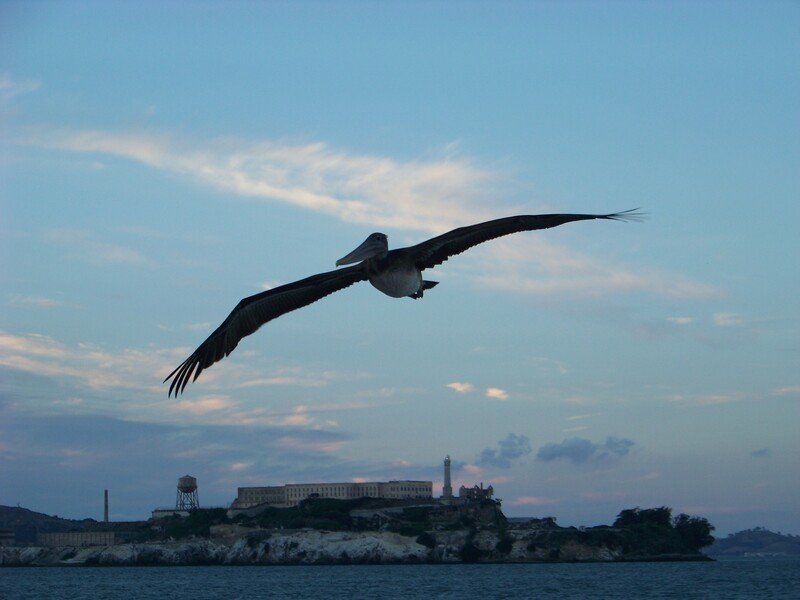 Over Alcatraz, I caught this pelican with the tinges of purple on the horizon, and the skyline with the evening shadows just beginning. 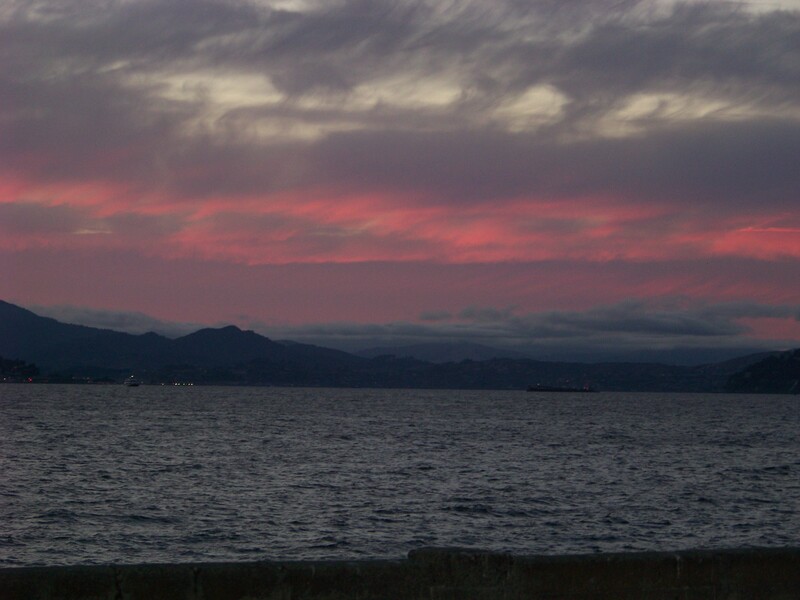 As I looked across the bay to Marin County, the sun set further and I was rewarded with some deeper hues. I guess sometimes when we don’t get what we’re looking for, we’re just looking in the wrong direction. This post is in response to a weekly Travel Theme challenge from Ailsa at Wheresmybackpack. Her theme for this week is Sunsets. To see her challenge and how the sun set for some other bloggers, click here. This entry was posted in Photo Challenges, Ruminations and tagged Honolulu, photography, photos, postaweek, San Francisco, Sunsets, Weekly Travel Theme. Bookmark the permalink. 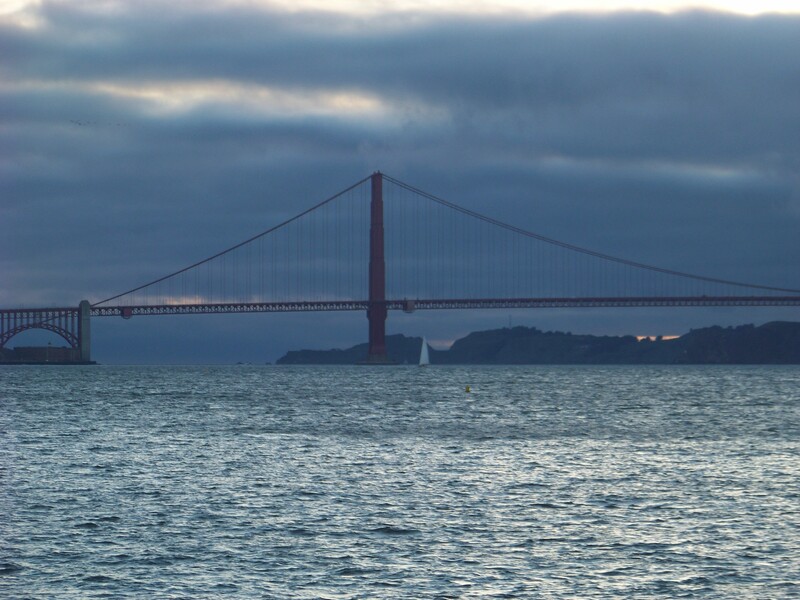 love these – I have so many of San Francisco, but not at sunset (we were just passing through for the day). I did get one really nice shot of a sailboat with the city in the background, though; most of my photos had body parts hanging around the perimeters…too many people on the boat!!! 🙂 Lord willing we’ll get another ‘shot’ at it. I love sunsets (sunrises too, but I see them less often…) and love how every one is unique. 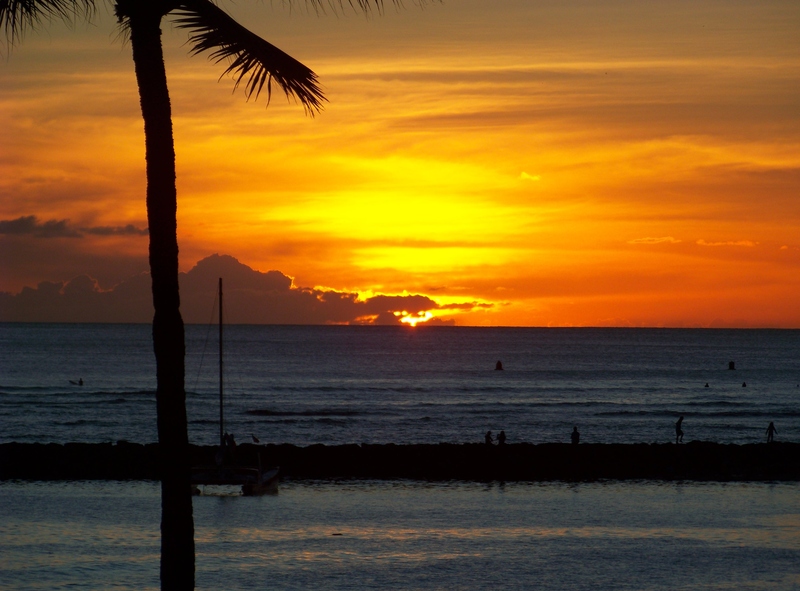 Your Honolulu sunset photos are stunning. Thanks, Heather – So glad you visited! Thanks, Ailsa – it was lovely!! 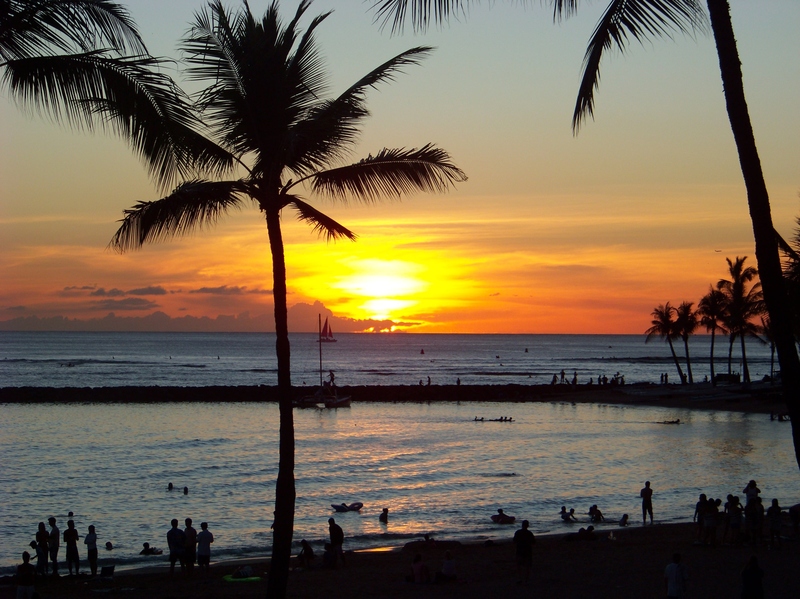 The Hawaiian sunset photos could almost be acryllic paintings with such vibrant colors. We couldn’t believe it as we were watching! I just kept snapping! Amazing sunset shots TRS! Love that pelicanl! Thanks! I like the pelican, too – I couldn’t believe my luck in catching him! Nothing more magical and romantic than a sunset close to a body of water. Beautiful! So true – thanks for the comment! Great pictures and nice thoughts, but on your first picture I see something strange and mystical that makes me wonder ; that blue ball in the middle of the ocean… do you know what it is? Yes – it’s a hang glider. If you click on the image you may see it a little more clearly! The hang glider in the sky I recognized, but the one in the water (underneath a little to the right) even enlarged, still looks rather weird, don’t you think so too? That’s a marker buoy – Maybe marking the limits of where boats should go toward the shore, or swimmers should stay to avoid boats and surfers. Aha! A major mistery solved, thanks a lot! I loved your take on sunsets, especially your thoughts on it… will think differently on it now when I see the sun goes down, down, down….. for a new beginning the next trip…. So glad you stopped in to visit! I love all your beautiful sunset photos. Gorgeous photos! 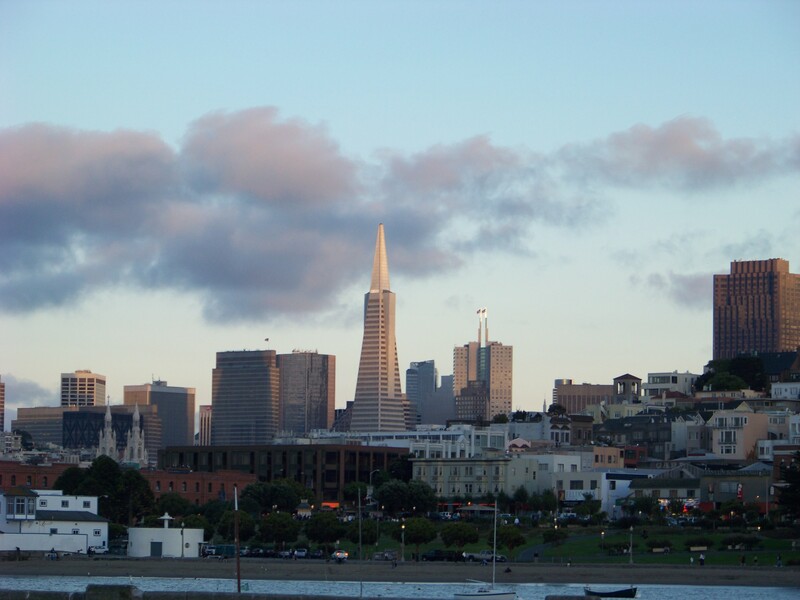 Of course, having lived in San Francisco, I may be biased, just a little. 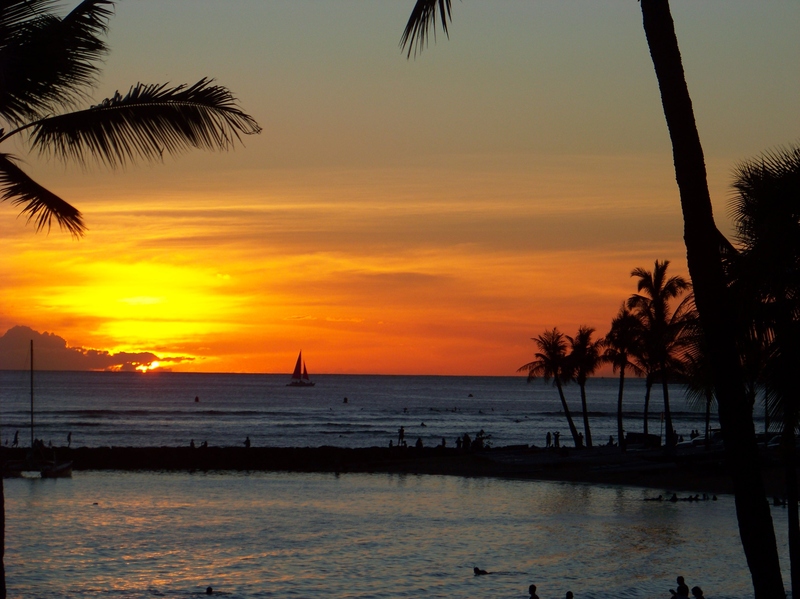 Those Honolulu sunset shots are just postcard stunning! Thanks, Lola – Lucky you, to have lived in SF! It’s such a great place to explore! That sunset in Honolulu was fantastic!! It was… loved watching it evolve! I knew I’d enjoy checking out this challenge. These are beautiful. Thanks, Jo – the responses to this challenge have been great to see! These are breathtaking photos. And you right in every word at the last sentence. Thanks – so glad you visited! Thanks – hope you get to Honolulu! Thanks – and thanks for stopping in! Many thanks, Jo. I agree – sunsets sort of evolve – you have to watch all the way to the end! Gorgeous sunsets! I like the way you turned around and found something even better – good lesson for life. Love your first shot, the silhouette and the color of the sky. Beautiful! Thank you! And yes, I completely agree with you that a sunset is the “promise of something new to follow”. Thanks so much for visiting – and for this lovely comment! Thanks so much – glad you stopped by!